The Electronic Rat Killer is an easy to use electric rat zapper that will kills rats quickly and humanely. The Electronic Rat Killer gives and electric shock to rats to kill them in seconds. Safe to use around children and pets as there is a cut off switch if the top door to the zapper is accidently opened. 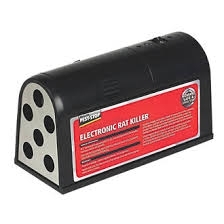 Uses 4 x C batteries and will kill up to 12 rats with one set of batteries. When a rat has been killed, a green indicator light flashes for up to 24 hours to indicate a rat catch. You then simply tip out the dead rat and reset the unit.